Merida, an impulsive young lady and daughter to King Fergus and Queen Elinor, is determined to carve her own path in life. Defying the age-old and sacred customs, Merida's actions inadvertently unleash chaos and fury with the other Scottish Lords, and in the process she stumbles upon an eccentric and wise old woman who grants her ill-fated wish. The ensuing peril forces Merida to discover the true meaning of bravery in order to undo a beastly curse before it's too late. Learn the lyrics to "Touch the Sky." 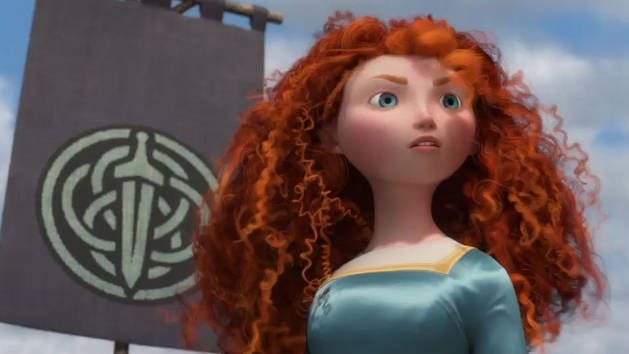 Princess Merida seeks to control her own destiny in Disney and Pixar's Brave. Disney cast members attempting Merida's accent from Brave for the Oh My Disney blog. See what fate has in store in the Brave Kingdom in Disney Hidden Worlds. Show your strength and prove yourself with your favorite games from Brave! Choose your clan and compete in Brave's Highland Games! Travel to a galaxy not so far away with WALL-E, a lonely robot who discovers love on a fantastical journey across the universe.